For many anglers, the transition from summer to fall also means a transition from long, leisurely days to days packed with school and work. This seasonal change also means switching to cold weather fish or storing their tackle until the spring altogether. Before you toss your gear in the garage or shed, it can be rewarding to make a few more trips to the lake for some fall bass action. Where do bass go during the fall months, though, and what do you need to do to catch them? Today we’ll take a look at three tips to help you get the job done right. If you want to find fall bass quickly, you simply need to find the baitfish. As the summer winds down, baitfish start to gather in schools and become the main food source for bass. Then as the water temperature drops, these schools move to the back reaches of creeks. When this happens, focus your efforts on secondary points (points that stick out from main points), steep drops in creek offshoots and bluffs on the main body of the lake. Stick around when you find where the baitfish are holding on your lake, too, as the bass will be nearby. Even in the colder months, the afternoon sun can cause baitfish and bass alike to seek shadier spots, making docks, laydowns and other shady cover perfect target areas. When fishing these locations, I start with a weightless wacky worm and skip it in and around this cover. 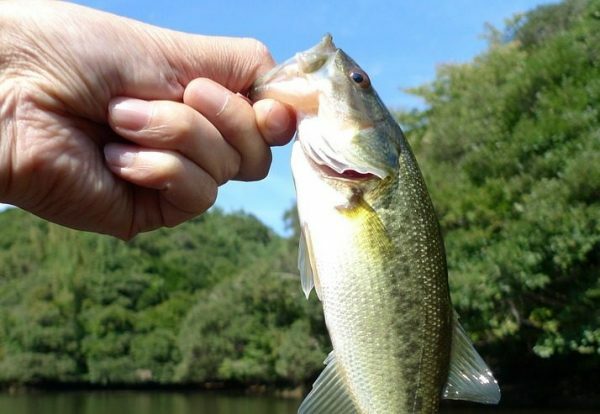 Mid-day fall bass often follow baitfish onto stumpy, shallow flats to feed. If a finesse tactic isn’t working, or if the bass are actively feeding, you can switch to a square bill crankbait like Strike King’s KVD model, which will draw reaction strikes when bounced off cover. When you zero in on a group of bass that’s sticking close to a given spot, it’s the perfect time to work shad imitating baits, such as topwater spooks, jerkbaits or swimbaits. Topwater baits like a Zara Spook use a walk-the-dog action to mimic an isolated, fleeing shad, which hungry bass just can’t resist. These presentation may be more aggressive, but when the bass around baitfish are actively feeding, all you’ll really need to do is get a lure into their strike zone and make them react. Bonus Tip: Don’t be afraid to use a rapid retrieve with these lures either; if your judgment is correct and the bass are aggressive, you’ll have no trouble capitalizing on the feeding activity.